1. Heat 800 milliliters water in a skillet, add 400 grams boneless chicken and stir well. 3. Boil until the chicken is cooked through. 4. Remove it from heat and drain the chicken. Cut it into small pieces. Keep aside. 5. Heat 20 milliliters oil in a skillet, add 1 teaspoon garlic, 1 teaspoon ginger and stir for 2 - 3 minutes. 6. Add 1 egg and stir well. 7. Cook for 2 - 3 minutes on medium heat. 8. Then, add 100 grams onions and fry till translucent. 9. Now, add 50 grams carrot, 50 grams cabbage and mix it well. 10. Saute the veggies for 5 - 7 minutes on medium heat. 11. Add the boiled chicken in it and mix it well. 12. Add 1 teaspoons alt, 1/2 teaspoon black pepper, 1 tablespoon soy sauce, 2 tablespoons coriander and mix it well. 15. Take a spring roll sheet and brush the sides with egg wash.
16. Place the prepared chicken stuffing on it. 17. Fold the sides and brush the end with egg wash.
19. Heat sufficient oil in a deep fryer and deep fry these until it turns golden brown and crispy. 20. Remove it from heat and drain it on an absorbent paper. 21. In a bowl, add 50 grams ketchup, 30 grams schezwan sauce, 1 tablespoon vinegar, 1/2 teaspoon powdered sugar and mix it well. 22. 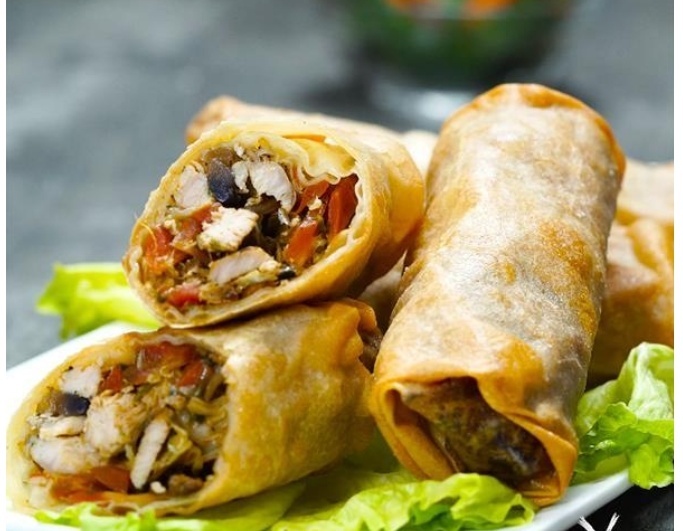 Serve hot spring roll with prepared sauce.